Fife, or the Kingdom of Fife, is located on the east coast of Scotland and is home to approximately 45 different golf courses. 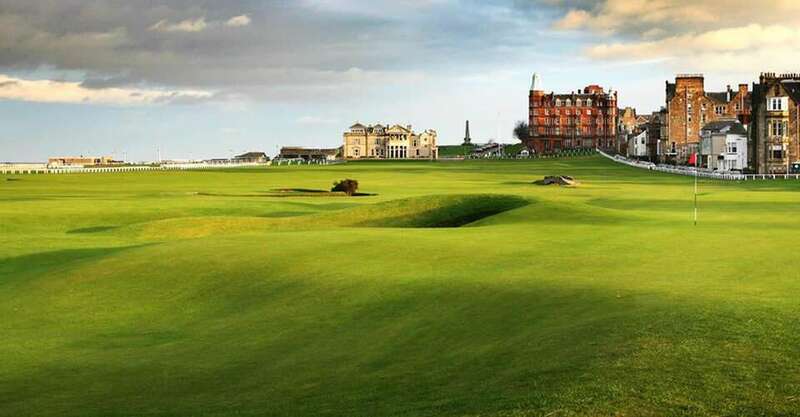 It is a historic region and is famous for the St Andrews Golf Club that was established here more than six centuries ago. In the year 1457, James II banned the sport of golf, as did James III in 1471 and James IV in 1491. But in 1502, James VI eventually bought himself a few golf clubs and gave in to the addictive sport of golf. St Andrews grew significantly over the years, till it opened its 7th golf course in 2007, which was named the Castle Course. Amongst the other popular golf courses in Fife, golfers can look forward to a wonderful golfing day at Dukes, Kingsbarns, Scotsgraig, Crail at Balcomie, Ladybank and Lundin. Fife is a beautiful part of Scotland and it can be seen in the spectacular settings that the golf courses have been designed on. Our philosophy is that we treat all of our guests as members and a truly warm Anster welcome awaits all visiting golfers. Anstruther Golf Club was founded in 1890 and has seen many changes over the years. The initial layout comprised 7 holes with trenches through the middle of the course and poles scattered over the greens to stop gliders landing during the war. In more peaceful times the course was extended to an excellent 9 holes which is kept in superb condition throughout the year. The course is located 9 miles south of St Andrews and stretches along the shoreline between Anstruther and Pittenweem. The spectacular views over Anstruther Harbour and out to the Isle of May, Bass rock and south west to Edinburgh are a constant distraction. Golfers should beware of Anstruther Golf Clubs version of Amen corner which comprises a series of 3 challenging par 3s starting with The Rockies (5th) voted the toughest par 3 in the UK! £15 for 9 holes and £25 for 18. Tel;01333310956 quoting "The Bank - Anstruther"
This course is a little easier to play and is considered to be more suitable for occasional golfers but is still known as The Wild Child of Kinross. Proof of this is in the par-39 outward nine where you'll find four par-5s in the space of six holes. However, spot the optimum scoring opportunities on the Bruce and you might not find your scorecard in shreds. The hardest hole? The par 4 6th at just 272 Yards! The course's unpredictability is most shocking on the par-4 6th. It only requires a mid-iron off the tee followed by a wedge, but watch out for the ball magnetic pond in front of the green, which often results in big numbers. It's difficult to pick the best par-3 on The Bruce but many golfers love the picturesque 16th. It's 160 yards from the white tees, but choosing the right club can be difficult as the green is long and well-protected. The par-4 14th provides an enjoyable shot downhill to the large green. Not as famous as that tricky 6th hole, but not likely to generate so much golfing angst. Although the par-5 4th hole might seem like an obvious birdie opportunity, even the strongest golfers leave the hole happy with a par. The second shot is perhaps the most difficult on the course, whether you are going for the green or not. 20% discount on seasonal rates. Tel 01577 863407 quoting "The Bank - Anstruther"
Elie is one of the finest links courses in Fife and for visitors, touring golfers and members alike it offers a warm welcome and an honest test of golf played over classic links terrain. It is one of the oldest golf clubs in the country and lies just 12 miles from the championship courses at St Andrews, the Home of Golf. The game has been played across the historic Elie links since the 15th Century and given the panoramic views and superb setting it is little wonder the course has established itself as such a firm favourite for visitors over the years. Tucked away in the beautiful East Neuk of Fife - Neuk is the Scots word for corner - Elie is less than an hour?s drive from Edinburgh and only 20 minutes from St Andrews. The course is open all year round, offering up its charms to visitors whether they come in the height of summer or the depth of winter. Indeed, Sir Michael Bonallack, OBE, perhaps sums it up best when he says: ?If you love links Golf, you will love Elie. Close cut running fairways with firm, fast, true greens. A memorable and enjoyable test for golfers of every ability.? 10% on seasonal rates - Bookings only at;book@golfhouseclub.org quoting "The Bank - Anstruther"
An 18 hole parkland golf course with 2 par 5s, 12 par 4s and 4 par 3s. It is 5951 yards in length with a course par of 70 and a SSS of 68.Elmwood Golf has a wide range of facilities to suit everyone, from beginners and juniors to the more experienced golfer.Set against the backdrop of the Tarvit &Lomond Hills our environmentally friendly course is gaining in reputation in Scotland's golfing heartlands and offers the flexibility to play golf as little or as often as you like. With various season tickets available from as little as £140, Elmwood is the ideal venue to play, practice and enjoy socialising with friends and family. Looking for a venue in North East Fife for your golf society day? Elmwood Golf is one of the top facilities in the area. Our golf packages offer excellent value for money and are designed to cater for the majority of visiting parties. We offer a wide variety of menus which include a range of breakfast, lunch and snack options as well as a warm up session on our driving range. Relax in the comfort of our clubhouse lounge with licenced bar, large screen television and pool table and make the most of the excellent facilities that Elmwood Golf has to offer. Monday to Friday £22 - Saturday &Sunday £26. Tel;01334658780 quoting "The Bank - Anstruther"
Designed by Old Tom Morris, Ladybank is a rare beast in Fife a tremendous inland course. It measures just over 6,600 from the medal tees, making great use of its heathland terrain. It has changed a little over the years, requiring the golfer to display real precision to hit the small and often contoured greens. There are a few dog-legs between the trees where care is needed not to get blocked out. Never easy but always fun. Of its type, one of the finest courses in the land for my money. The experience here is always a rich one. Standing on the 1st tee, you know you are in for a treat. 20% discount on seasonal rates. Tel 01337830814 quoting "The Bank - Anstruther"
Whilst golf has been played at Leven since 1820, the game dates back to 1846 on parts of these links with the current configuration coming into being in 1909. The history of Leven Links is, suffice to say, long and complex but what is most important is the nature of the ground upon which it is built. Local conditions of winds and tides during prehistoric times, when sea levels were falling combined to produce a series of parallel dune ridges which give Leven Links a truly unique signature. Mon - Fri £25 -Sat - £25 December to February. Tel;01333 412390 quoting "The Bank - Anstruther"
The Lundin Golf Club was founded on the 8th May, 1868. In that year the Leven Clubs had extended their links from the Mile Dyke eastwards towards Lundin Links. This extended course occupied the narrow strip of land lying between the railway line and the Firth of Forth.The first captain of the Lundin Golf Club was Mr Rintoull of Lahill who, as immediate Past Captain of the Innerleven Club, had been influential in the decision to abandon the Dubbieside Links in favour of the popular green at Leven. The Lundin end of the links was described in 1868 as benty, tussocky and ripe with whin, with which the errant driver of today might still agree. It would appear that the club had great difficulty in establishing itself. Despite the efforts of the Innerleven Club who offered prizes to encourage play, the Lundin Club went out of existence some nine years after its formation.The club was resuscitated in 1889 with an annual subscription fixed at 2/6 and an entry fee of like amount. A two-roomed clubhouse was built costing £70 and the Club quickly became established as a healthy constitution. The course was administered by a Joint Links Committee made up of members of the Innerleven, Leven Thistle, and Lundin Clubs. The Leven end of the links was leased from Mr R Maitland Christie of Durie and the Lundin end from John Gilmour of Montrave (later Sir John and Captain of The Royal &Ancient). Mon - Fri £68 - Sat - Sun £77. 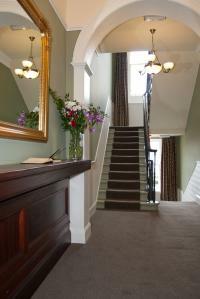 Tel;01333 320202 quoting "The Waterfront - Anstruther"
The more senior of our two courses at Kinross is The Montgomery. The Par 72 is 6,508 yards and provides some unique challenges for the more accomplished player with very few golfers managing to break 80. The hardest hole? The par 4 18th at 443 yards! There are 19 strategically placed bunkers and a pond to make life a little more interesting for golfers but perhaps the biggest aggravator is the very last hole. Many golfers have stood on the 18th tee with a decent scorecard, only to have their hopes dashed with the brutish 443 yards to a difficult green on this par 4. The best Par 3 on The Montgomery is the 4th, just 139 yards uphill to a green that slopes considerably from front to back. Any shot that finds the front right bunker is almost instantly a bogey and chipping around this green is never easy. The favourite par 4 on the course is the 16th. Placement off the tee is vital and there is a long iron approach to a well-guarded green. Make the green in two and walking off with a par is usually a result. The 11th is The Montgomery's best par-5 with its pond that makes this 498 yard hole a great risk and reward test. It is especially so for those playing the yellow tees at 465 yards:given the right wind and ground conditions, it will be very tempting to fetch the green in two. But beware - the second shot must be perfect or it will likely find a watery grave in the pond. 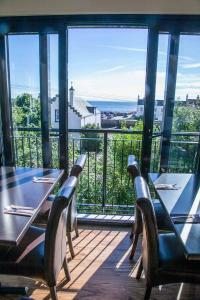 20% discount on seasonal rates; 01577 863407 quoting "The Bank - Anstruther"